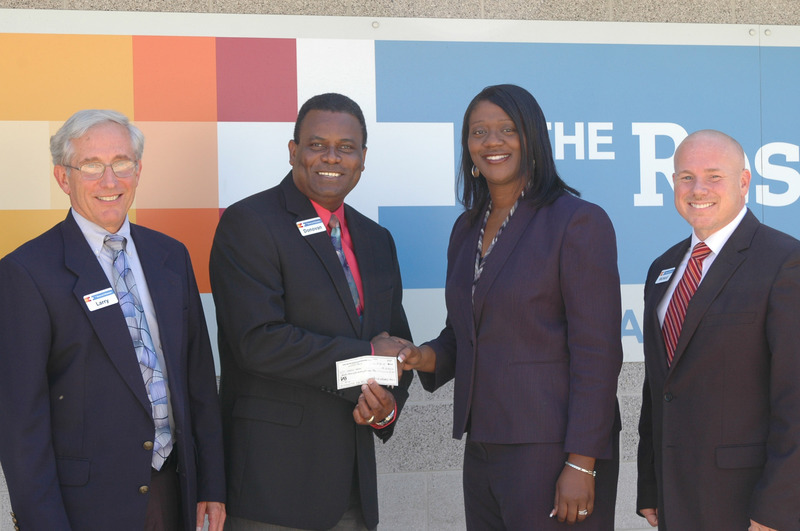 Former Fort Wayne Sports Corporation’s (FWSC) president, Tiffany Gooden, presented to Pastor Donovan Coley of The Fort Wayne Rescue Mission/Charis House a check for over $12,000 on September 12, 2013. The check represented a portion of the money raised at the FWSC’s annual “Party in the Park III” event, held on February 1, 2013 at Parkview Field and hosted by former Seattle Mariners Manager Eric Wedge. Charis House is a part of the Fort Wayne Rescue Mission that provides assistance to homeless women and children. Over the last three years, the FWSC has raised funds from its annual event and distributed a percentage to area non‐profit organizations, such as the Red Cross of Northeast Indiana and Charis House, while retaining a share for its own civic activities and projects. facing a homeless crisis, we thank all who made this annual event a success," remarked Pastor Donovan. Executive Committee of the organization. February 7th, and will remain at Parkview Field. in the crowd as part of the night’s festivities. for this event by contacting Adam Henry at (260) 426‐9706 or by visiting the FWSC’s Web site at the "Join Us" - Events page of www.fortwaynesportscorp.com.